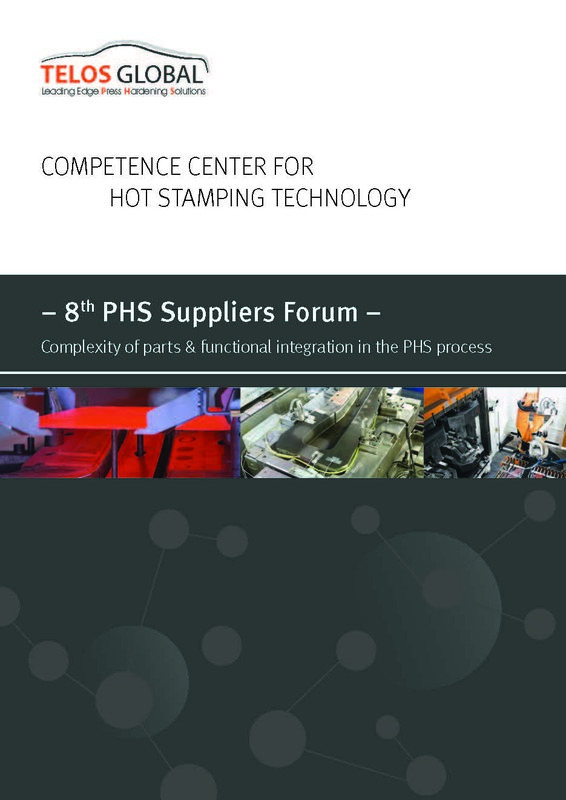 "COMPLEXITY OF PARTS & FUNCTIONAL INTEGRATION IN THE PHS PROCESS"
From 23 – 26 October 2018 the 25th International Sheet Metal Working Technology Exhibition opened its doors again in Hanover, Germany. It has been serving the sheet metal working industry as their leading international trade exhibition. TELOS Global specializes in the conception, design, training and production associated with high-quality press hardened steel and aluminum stampings, tooling and the associated thermal and production equipment. Selected input within the PHT-industry sector and experts including key players in the PHT-markets including OEMs and Tier 1 suppliers introduced you to the state-of-the-art technology. TELOS Global specializes in the conception, design, training and production associated with high-quality press hardened steel and aluminum stampings, tooling and the associated thermal and production equipment. Selected input within the PHT-industry sector and experts including key players in the PHT-markets including OEMs and Tier 1 suppliers introduced you to the state-of-the-art technology. From the scientific point-of-view you received an update on the newest developments, trends and background knowledge in PHT, as well as hands-on training. TELOS Global LLC and Impression Technologies Ltd will be sharing a booth at the 7th Global Automotive Lightweight Material in Detroit, August 21st-23rd 2018. TELOS Global specialises in the press hardening conception, design, training and production associated with high-quality press hardened steel and aluminium stampings, tooling and the associated thermal and production equipment. The Development Engineer Federico Melotti will be co-presenting with Managing Director of TELOS Global, Axel Weiand on Thursday, August 23rd, 2018, following a panel host by the Aluminium Association. To register, please visit www.global-lightweight-vehicle-manufacturing.com/. Come and join us to gain valuable input in the Press Hardening Technology (PHT) and learn where the tripping points of implementation and processes can be identified. We are organizing PHS training specific to your high level needs, training schedules and training dates, available for NAFTA companies and their employees. The focus for TELOS Global is “Optimization of the PHS Process” which encompasses presentations as well as hands-on training. Selected input within the PHT-industry sector and experts including key players in the PHT-markets including OEMs and Tier 1 suppliers introduced you to the state-of-the-art technology. From the scientific point-of-view you received an update on the newest developments, trends and background knowledge in PHT, as well as hands-on training.